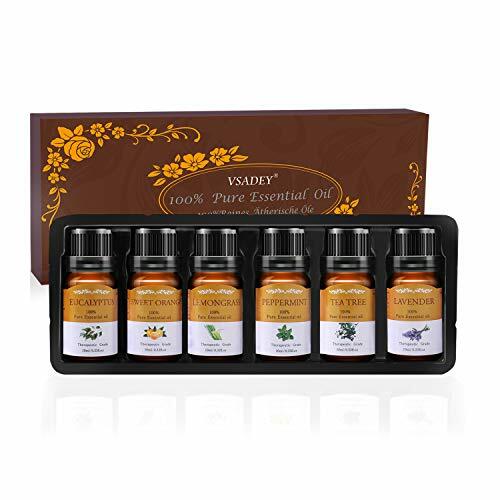 VSADEY Top Six Vitality Extracts Essential Oil Set is the perfect starter kit or gift set for anyone interested in aromatherapy. Package includes 6 bottles, 10ml each, provides multiple aromatherapy healing, cleansing and fragrance benefits. Flavors included: Tea Tree, Lavender, Eucalyptus, Lemongrass, Peppermint and Sweet Orange. 100% Pure and Natural Relaxation Essential Oils Blends: No added additives, fillers, bases or carriers, just pure Essential Oil. No chemicals, no adulterated and no harm to your body, suitable for vegetarians and vegans. Allergen-free, paraben free and cruelty free. Steam distilled and cold pressed. Also suitable for men. Therapeutic Grade Plant Therapy Oils: Lavender helps with cognitive functions and alertness; Lemongrass yields serenity and clarity; Tea tree promotes mental strength and calmness; Peppermint stimulates concentration and purification; Orange promotes optimism and peace; Finally, Eucalyptus brings about optimism and concentration. Our stress relief air essential oils are suitable for diffusion, humidifier, spray, vaporizers, inhalation, cleaning, massage, body oils, oil burner, perfume, home care (bedroom, living room, bathroom, study room), office (workstation, conference room), outdoors, campground, yoga room, car and spa. Highest Quality Guaranteed: All Essential oils from VSADEY are bottled in MSDS certified facilities. Our Customer Service Promises 100% Money Back if you are unsatisfied with VSADEY Essential Oils in any way. So just take it away with 100% pride and confidence!